First of all, happy May!!! And happy first day without rain in way too long!!! To celebrate this first day of a (hopefully) warmer and (hopefully) drier month, I was able to get out and take pictures to share with all of you. First up is the tiny bird’s nest I discovered in the small garden cabinet I keep on the front porch. 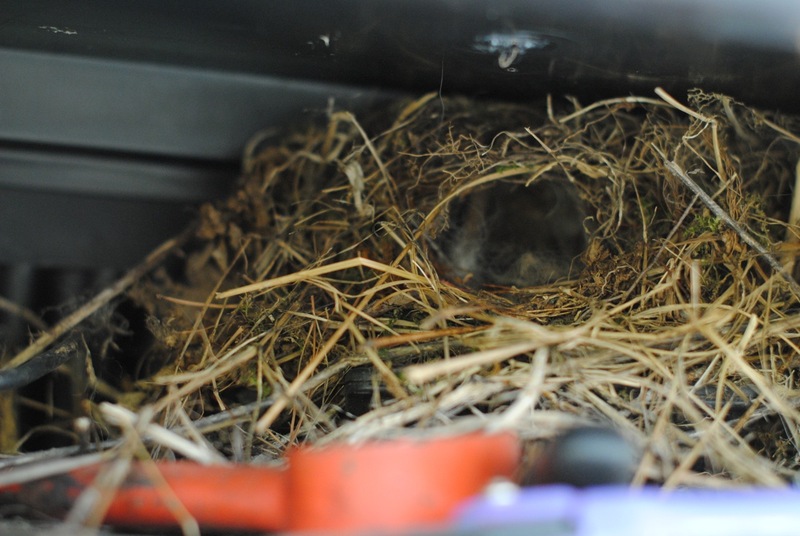 I went out to fetch some lambing supplies and the mama bird swooped out of the nest, nearly hitting my face. I know there are eggs in there, and I occasionally see her leaving and returning. Fortunately she put her nest on the top shelf of the cabinet, which itself is in a fairly out-of-the-way place. Since our baby bunnies hopped from their nest and out into the world (on Easter, no less! ), it will be nice to see tiny baby birds soon. 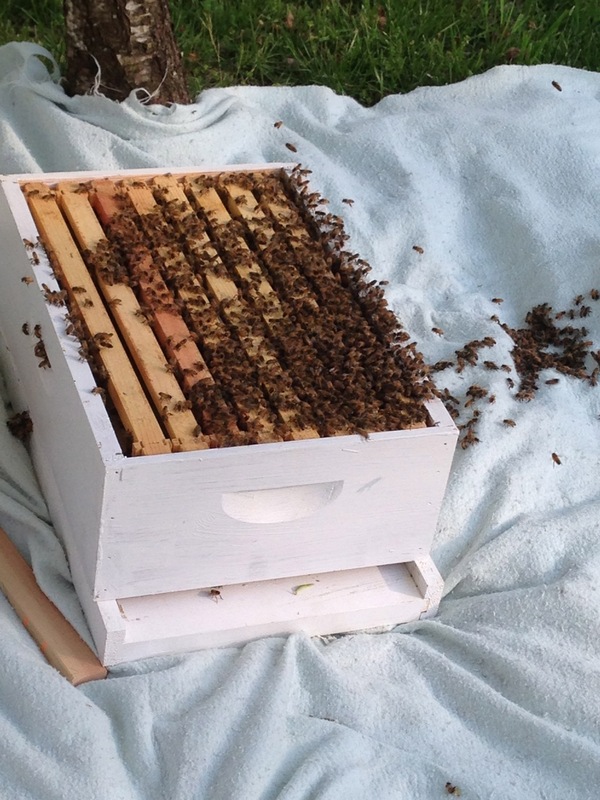 In other, rather more exciting news……we have honeybees! My friend Amy raises honeybees, and she contacted me on Monday to let me know she had a swarm, if I’d like to collect it. It was in a rather nice cluster on a branch of her peach tree. I grabbed one box of my empty hive and dashed over. Of course, I totally forgot I had my friend Erin’s beesuit here, so I went with a bee veil and gloves, along with a thick flannel shirt. I stood under the swarm with my hive box while Amy shook the tree branch downward (normally you could cut the branch and lower it onto your box, but this was a big, main branch of the tree). 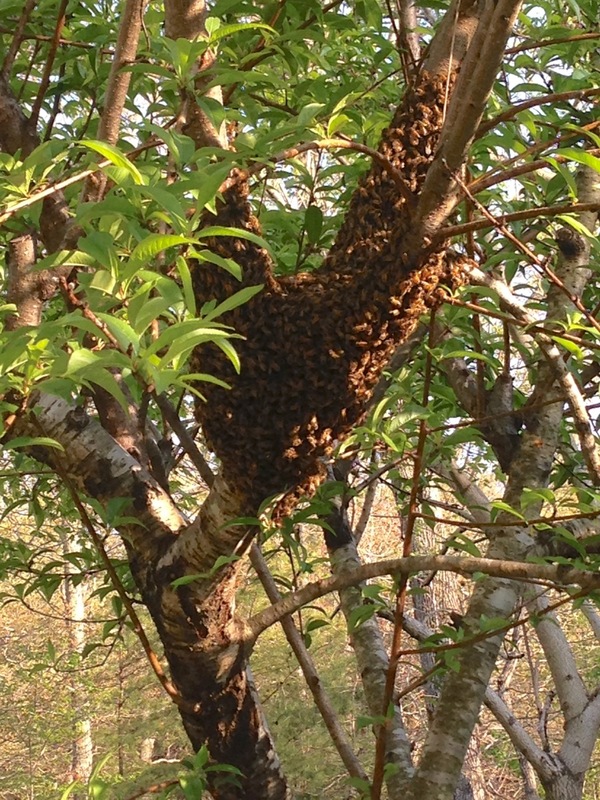 I was instantly covered with what felt like thousands and thousands of bees, and they were heavy altogether. And I only got stung once, through my shirt, which as it turns out, was not thick enough. Lesson learned. 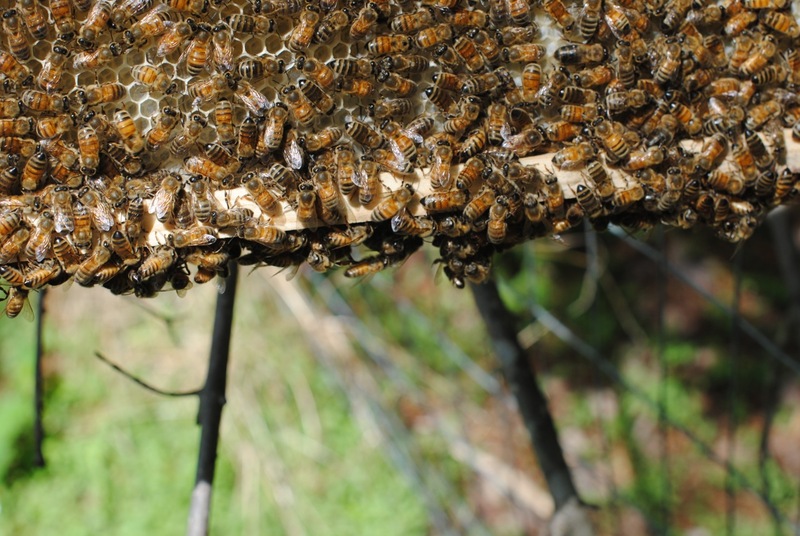 I carefully lowered the box and we watched the bees form a steady line into it, meaning we had caught the queen with the initial shake. At dusk the bees were all in and the box was covered and taped up for the ride home! I had a hard time finding/making a level spot in the front garden for them, and at some point I will have to make some adjustments to get it a bit more level, but for now they seem pretty happy. And BUSY! 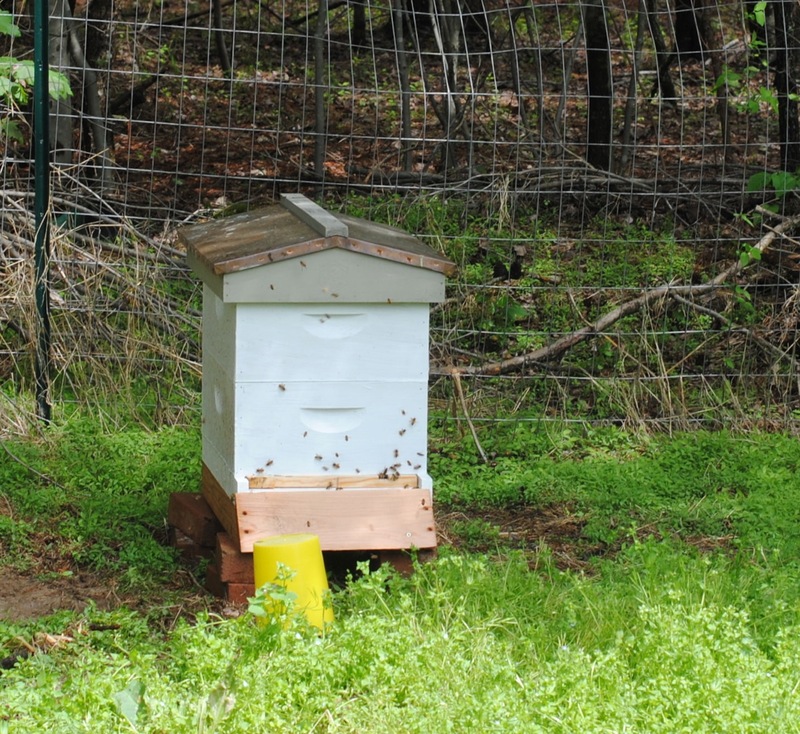 There was very little activity outside the hive the last three days because of the pouring rain, but today when I went out to open the hive and check, they were extremely active. More bees than I could count were returning into the hive, their back ends heavy with orange pollen. 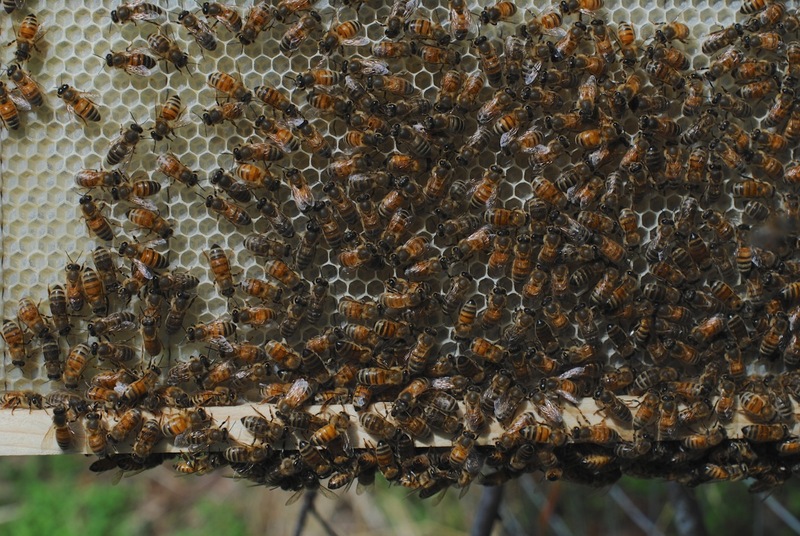 Inside, there was an astounding amount of comb built, and it looked like they were starting to fill some of the comb cells. Sorry for the less-than-stellar pictures. It’s hard working a camera through a bee suit, while holding a frame in one hand. I fed them quite a bit of sugar syrup while the weather was bad, since they weren’t leaving the hive, but it seems they are finding their way now. Next week we are waiting on delivery of a second hive and my friend Louise will drive down from Northern Virginia to deliver a second colony. I am crazy excited for all of the pollinators we will have for the gardens this summer! Oh the pictures were fantastic! I just finished reading “The Wedding Bees” purely fun fiction by one of my light authors revolving around a woman and her bees. I am excited for you!.